Procrastination is defined as the act or habit of putting off or delaying, especially something requiring immediate attention. Sound familiar? Yeah, me too. I’ve struggled with procrastination my entire life so it’s time to see how to prevent it. I had a teacher in high school who told me that she hated to keep dropping my essay grades because they were always a day late, but she didn’t want to push me to get them earlier because she believed the quality of my writing would go down. I think she was right. I found two camps regarding overcoming procrastination. Those that fall under the first group provide a series of steps to follow. All you need to do is pull yourself up by your boot straps and follow the steps and your life will be changed. The second group, made up of mostly doctors, believe that chronic procrastination is a problem too deep to shake off. They believe depression, anxiety, and perfectionism are all contributors themselves, and to each other. Having strong willpower is not enough. Because they are typically doctors, and because I believe chronic procrastination is a result of deep rooted psychological problems, I’ve chosen to delve deeper into the beliefs of the second group. Maybe I’m wrong for turning my nose up at the first group, but, following steps in a magazine article does not seem likely to produce life changing transformation. Timothy A. Pychyl, Ph.D., is an associate professor of psychology at Carleton University in Ottawa, Canada, who specializes in the study of procrastination. I love the idea of being a specialist in procrastination. Does he use experimentation as an excuse when he is late for work? Anyway, In a June 21, 2013 article of “Psychology Today, “Dr. Pychyl describes working with a student who was collecting data from undergraduate students using self-report measures. Each student measured a score each day on their depression levels and a score on their procrastination. Having people log their feelings on some type of scale is typically a pretty lousy way to experiment, but the results were interesting. In the study they found that when they measured self-regulation skills, the relation between depression and procrastination disappeared. Being a bear of little brain I had to look up Self-regulation. It is the self’s capacity to alter its behaviors, or, as they say, – “put one foot in front of the other and just do it”. Now Wait One Minute! I chose to side with the doctors because I thought they would not agree with the pull yourself up by your bootstraps crowd! Apparently I was wrong. Dr. Pychyl shares a personal experience to further explain the test results. Dr. Pychyl describes working through his grief period after his mother’s death through self-regulation. Though depressed, he did it by going about his daily routine, such as feeding his kids, going to work, doing chores. He stated that he had no joy in any of it, but he did each thing as intended. “Showing up is half the battle with self-regulation,” he states. Here is where I am disappointed in the good doctor and his findings. He acknowledges that his recommendations are more difficult for the chronically depressed, but he never states how to get around that. Maybe, that is because there is no easy way. How do you tell someone who can’t even get out of bed in the morning that they need to get up and just do it? How do you tell someone who hasn’t opened the window blinds in weeks that they just need to fake it until you make it? From reading Dr.Pychyl’s article, and many others, aside from antidepressants, there is no magic pill that is going to make you stop procrastinating. It’s just a matter of willpower and you have to hope you have enough to get past it all. From reading Dr.Pychyl’s article, and many others,there is no magic pill that is going to make you stop procrastinating. It’s just a matter of willpower and you have to hope you have enough to get past it all. What I learned from all this is to be easy on myself. Try not to procrastinate, but don’t beat the crap out if myself if I can’t get out of bed. If I’m able to get out of bed, but can’t focus on writing an article for this blog, well, the world will keep spinning if you have to go a day without reading one of my outstanding articles. I swear to myself not use my depression as an excuse to procrastinate, but I will allow myself to put things off if it allows me to take better care of myself. I hope you’ll do the same. Oh my gosh. When I decided to Google laziness, procrastination and depression I hardly expected to find so many people who feel exactly as I do. I am totally frustrated that I’m unable to discover why I feel so bad. Many years of therapy, many antidepressants and combinations of medications and recently completed a series of 37 TMS treatments. Nothing has made a significant difference. I dread going to work every day but I have no choice – even though I am the wife, I am the bread-winner and my husband is retired. I carry the health insurance. As others have posted, putting forth the effort to accomplish tasks is difficult and the results don’t necessarily seem worth the effort. I know that exercising, “just doing it” will make me feel better, but again, the effort is too much. It seems as though I really don’t WANT to get better. Can that be it? Anyone else out there feel disappointed when you wake up each morning? For me I think it is vitamin deficiency. But who knows. I do feel so overwhelmed sometimes with the day to day that it feels suffocating. So tired of working, of getting up every morning knowing I have the major responsibility for supporting my spouse and myself. I’m a 60 year old female and work in municipal government. This morning I started to investigate how to qualify for Social Security Disability. Thank goodness it’s Friday and I took at 1/2 day vacation. Wish I could have stayed in bed this morning with the covers over my head. I am not productive in my job, and feel guilty about it, but still not able to force myself to do many of the tasks for which I’m responsible. That was a blog that I am so glad I read. Thank you. I hope you write more on the topic. Thank you, Krista. Here’s another one that is somewhat similar. I struggle with these same issues … Chronic procrastination, supported by various factors … anxiety, low self-esteem issues, depression, fear of loss and failure, perfectionism. I am “functional,” in that I do enough to conceal this from almost everyone, which makes it harder in some ways. I have what feels like mortal combat, every single day, fighting through it to produce work product to the best of my ability. Some days I win, some days I lose … But it is a daily battle. And it is exhausting, which is just fuel for the fire, as I burn hours upon hours of my day. I am afraid to tell anyone, but at least to myself and others (anonymously), I am now saying out loud … I am NOT okay, and I do not know what to do. You could have just described me. well as major chronic procrastinator, i have myself come to the conclusion that the 2 are closely related. It’s very clear to me that my procrastination gets worse when my mood does, and i feel little energy or motivation to do anything. And i agree totally with Bradley about how over-simplified the “pull yourself up” advice is, particularly for those procrastinators affected with chronic mood disorders. Not that i don’t believe “there’s power in action”, as some famous person said. It’s just that i think when one’s overall mood and energy levels are very low, getting ANYTHING started often seems just not possible. Think the necessity for both Bradey and me is that we need to keep on searching diligently on finding ways to deal with the depression/dysthymia/anxiety 1st, because unless that improves i believe it’s unlikely that one’s procrastination will in those folks who have chronic mood disorders. I have 2 days drive – tops- then O am I needing rest. Do I sleep….no I procrastinate on that til I am left with maybe a 4-5 hr sllep window before I have school and long 2.6 hr commute., read blogs like this or play an old Microsoft video game from 1997, I don;t read my homework aaisgnments till later, never on time never early, Slow & distractable 20 pages at a sitting is a historic event every few months. My IQ gets me by since I do listen to lectures but that is not good for excelling and memory. I now have a 5.5 sleep window. I’m not good at fooling myself. so reverse psychology doesn’t usually work for me. It may work for some. I have a cousin at Carleton U. Can you use reverse psychology on yourself? 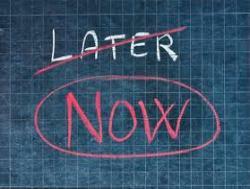 Commit to procrastinating, which means you’ll avoid doing it? Hideously loud and obnoxious alarm clock placed far enough away to force you out of bed to turn it on?